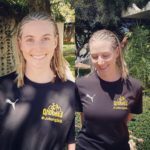 There must have been something in the water at Lusaka as three of the Joburg2Kili team decided to have makeovers on our rest day; Cam got her hair braided, Warrick shaved his hair and Bryan decided spontaneously to cut off his beard. A big thanks to Lawrence and Michelle for having us all to stay in Lusaka for a much needed rest day. It was time for us to head east towards what is probably one of the hardest weeks of cycling for this entire trip. Lawrence kindly lead us out of Lusaka via back roads in the morning as the traffic in Lusaka is apparently really bad so we avoided it completely which was great. 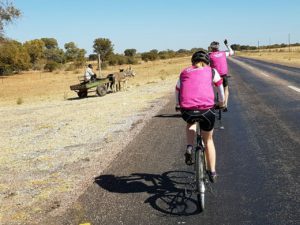 We were then in for a long ride of 125km to get to a bush camping spot that is marked as Dam View Chalets on Tracks for Africa. 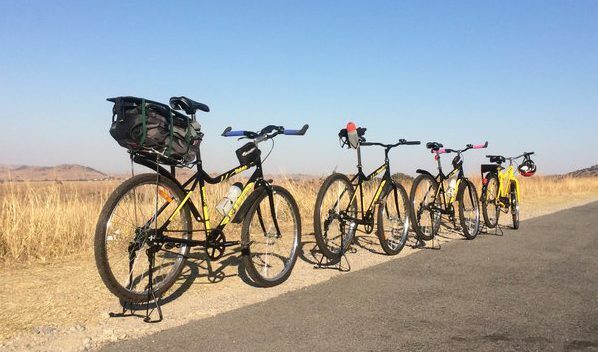 We started to get a taste of what is like to ride up mountains on our single speed Qhubeka Buffalo bicycles on this leg and definitely felt the burn in our legs. Dam View Chalets is nothing like the title suggests but rather a pond situated by an orphanage where you can get permission to camp from the local boss. 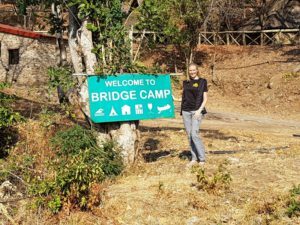 Our next leg of our journey was a 110km ride to Bridge Camp which is situated on the Luangwa River and is a recommended stopover along the way to Chipata. 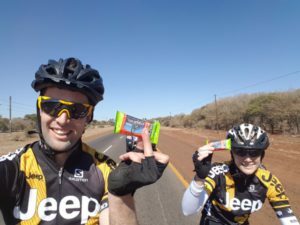 Unfortunately, Derrick has been struggling with a cough and flu-like symptoms and in the first 40km of the ride he was feeling very flat and decided to rather call it a day and travel in the Jeep with Bobby. It definitely effects the whole team when someone is not well but Gareth, Warrick and Cam had to soldier onwards. On this leg we hit the hardest and longest mountain climb to date. We were literally travelling around 7.5km/h at the steepest part of the climb which went upwards for 10km. 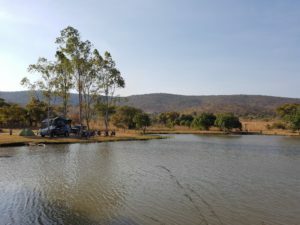 For the rest of the ride the team had big rolling hills to contend with until reaching Bridge Camp which has a beautiful location looking over the Luangwa River where we had one rest day planned. 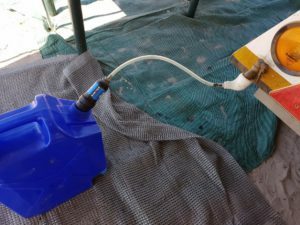 We had an issue with the plug point that controls the lights on the trailer and so Bryan decided to go back to Lusaka to get a part to fix it. We arranged with the local boss at Dam View Chalet to leave our trailer as it would not be safe to drive without the lights working. Bryan being the handyman he is managed to sort it all out with no problem and met us at Bridge Camp in the evening. We decided as it was such a hard day riding, Derrick not feeling very well and Bryan only arriving in the evening that it was worth having dinner at the restaurant. We were the only guests staying at the camp that night so we just chatted with the owner, William and had a chilled evening. 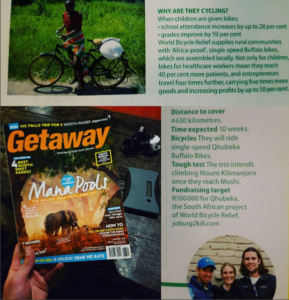 William had also recently bought the Getaway magazine and we were very excited to see an article placed about us in it. The next day we had a rest day which was definitely needed to get our team back to health as Derrick was still not feeling 100% and sadly, Bobby woke up feeling man-down so he just spent the day sleeping and resting up. The rest of the team spent the morning doing a few errands like sorting out our food crates and cleaning up around camp and then in the afternoon we enjoyed relaxing up by the pool area. For sun-downers we thought we would drive to find a spot where we could walk down to the river. On our way down to the river we were followed by a whole group of local children who just wanted to sit and watch us and dance a bit to our chilled music. Whilst chilling by the river we noticed a hippo pop up in the distance. 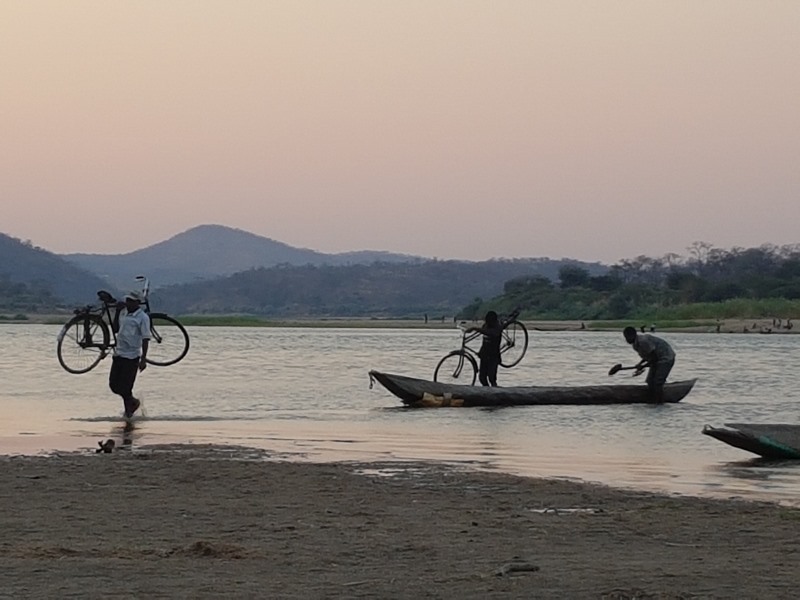 The Luangwa River is actually the divide between Mozambique and Zambia in this area and we were very fascinated to watch a local row his Makora across the river to go fetch two people on the other side of the river in Mozambique with two bicycles. 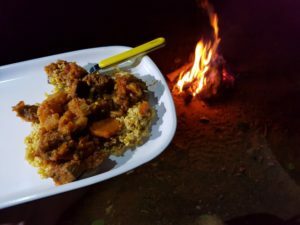 That evening at Bridge Camp we met Johan, who is a South African that is riding from Cape Agulhus to Cairo which has been his 40-year dream that has finally come true. 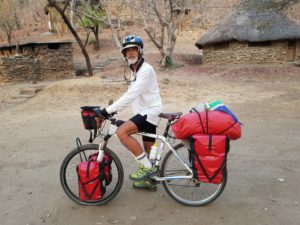 He is doing the cycle unsupported with pannier bags and we wish him all the best with his journey. 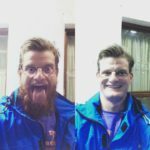 To follow him, check out his blog. The next day we decided to try out a shuttle service plan as we were warned against bush camping along the next stretch of road. This also meant that Bobby could stay behind at Bridge Camp for the day as he was still not feeling very well and would only have to come fetch us late in the afternoon. 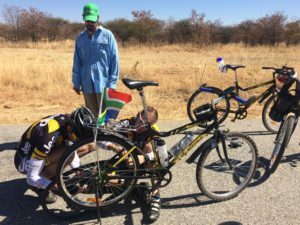 Derrick was feeling much better which was great to have him back on his Qhubeka bicycle; although he is still struggling a bit with a bad cough. We had a very tough 120km mountainous ride ahead of us with a lot of headwind. The only good thing about the riding conditions was that the road just over the Luangwa Bridge has been re-tarred all the way to Chipata and is a beautiful smooth road. 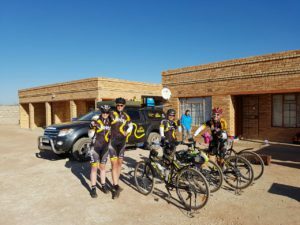 After riding close to 7 hours we reached the 120km mark and called it a day where Bobby met up with us so we had the two cars to load the bicycles on and drive back to Bridge Camp. Although the shuttle service plan in theory sounded great it meant we only got back to camp early evening and we all felt really exhausted. The next leg was a 114km ride to a bush camping spot. We got up really early to get the cars packed and bicycles loaded so we could drive ahead 120km to the spot where we stopped the day before which was our start point. As soon as we got out the cars we were like celebrities as all the local children and adults from the village came out to greet us. 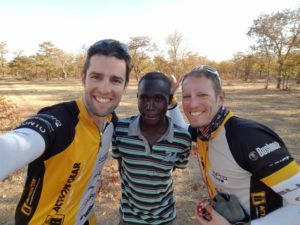 One thing we have all found really interesting over the past few days is that whilst riding past villages here in Zambia all the children come sprinting out of their homes shouting “How are you?” and waving to us. It is really special to see them and how just a simple wave back or saying “I am fine” brings big smiles to their faces. Sometimes there are up to 20 children shouting “How are you” and it almost sounds like a school war cry which is pretty amazing. We had a really hectic headwind the whole day along this leg. The ride was up and down really big rolling hills for over 100km which was hard work after the previous day of mountain climbing without gears. There was also a 16km detour road that we managed to avoid and rode along the old tar road thankfully as the detour dirt road was very rutted. The team definitely took strain on the ride which was evident as no one was talking and our 20km stops were taking a lot longer than usual. Bryan went ahead to find a suitable bush camping spot and managed to arrange with a local school to let us set up camp for the night. Today we had a 115km ride to Chipata where we are staying at Mama Rula’s Campsite. In the first 12km of the ride, Cam got two punctures in her back tyre which wasn’t ideal. The rest of the ride was better than expected but we still had a headwind to deal with. We are all very relieved to have a rest day tomorrow to give the legs a break from some tough riding over the past few days. 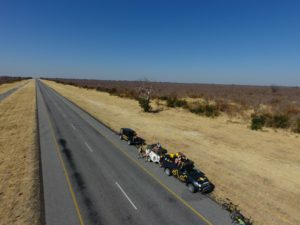 We are now official over the halfway mark around 2400km into our journey and will be entering our next African country, Malawi on this adventure on Friday. 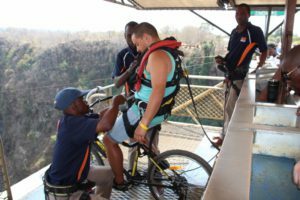 Thanks so much to Louzel Lombard from Traveller 24 part of News24 for the Q&A session with our two cyclists, Gareth Pickering and Derrick Fourie, who bravely bungee jumped off Victoria Falls Bridge on Qhubeka Buffalo Bicycles. 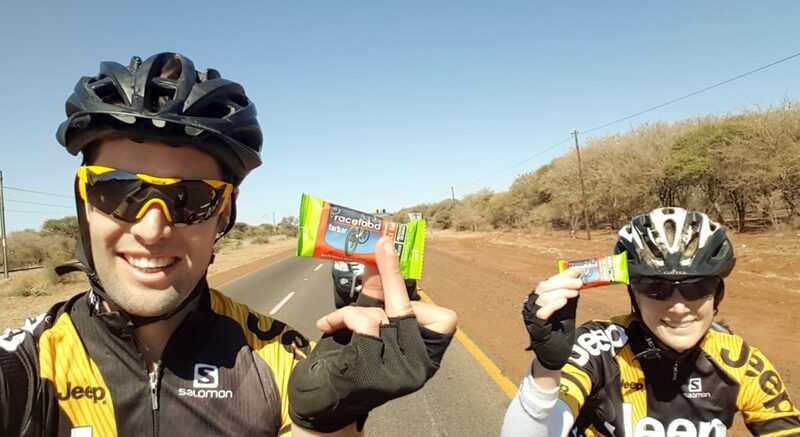 To read more about why Gareth & Derrick joined the Joburg2Kili for Qhubeka Expedition and what the highlights and low-lights of the trip have been so far, please click here. 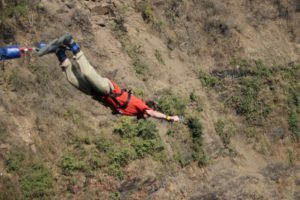 To watch the bungee cycle and find out more about how Gareth and Derrick have made history, please click here. 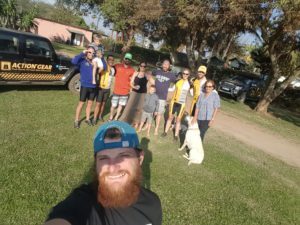 Since leaving Livingstone we have ridden over 500km in 5 days to get to Lusaka where we are now staying for a rest day at one of Gareth’s friends, Lawrence and Michelle, who have kindly let us stay with them for two nights. 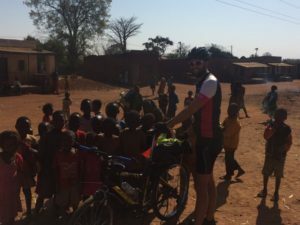 Our journey up north to Lusaka has been an incredible experience with some really tough riding conditions but the highlight of the week has definitely been the generosity of the local farmers and people in Zambia who have welcomed us to stay with them along our way. 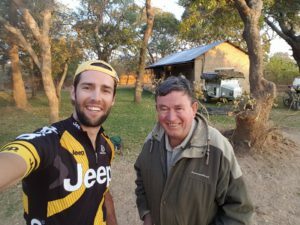 From Livingstone we had a windy, hot ride of about 100km to what was meant to be a night of bush camping but Bryan managed to go ahead and speak to a farmer in the area called Marius and his wife, Rochelle, who were very happy to have us to stay the night. In fact, they had read about Gareth and Derrick bungee cycling on News24. 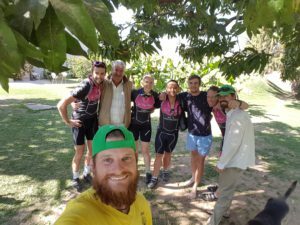 They were very kind to us and also put us in touch with another farmer, Tim, who was situated just outside Choma where we had planned to bush camp the following night after riding a further 100km. Tim took some of the team on a tour of his farm which was very interesting to learn more about farming in Zambia and how he spreads his risk by farming various things including tobacco, maize, cattle and sheep as well as black carrots which none of us had ever heard or seen before and sampled in one of our dinners. That night, Bryan ended up having to share his tent with Tim’s two big brown Labradors and a Jack Russel which was absolutely hilarious to see how determined the dogs were to sleep in his tent. From Tim’s farm we had a long ride of 109km ahead of us to get to Moorings Campsite, which is just after a town called Monze. Riding through Monze we had sight of where riots had taken place by seeing the debris of burnt tyres left on the side of the roads. This we have learnt is as a result of the recent elections in Zambia which is believed to have been possibly rigged. 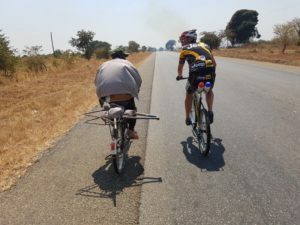 Whilst riding in Zambia we have all been so impressed to see how bicycles are a part of most people’s lives here to help them get around, carry things as well as to transport children. We have spoken to a few of the cyclists along the way who have all been so friendly. One local cyclist called Donald rode with us all the way to Monze and even took on Warrick in a short sprint off. He also believes Cam is his daughter as she is born in the same year as his actual daughter. From Moorings Campsite we rode 96km to a location that was marked off for a bush camp just outside the town of Mazabuka. This was probably one of the toughest rides of our whole journey as we had a 30km/h headwind for most of the way along with rolling hills and the road surface was no longer smooth but rutted and had many potholes. We were very lucky though as Bryan’s dad has been working with a guy called Johan Beukes who lives in the area who kindly welcomed us to come stay with him, his Italian wife Paola and their two adorable kids, Luke and Giovanni. Johan and Bryan met us along the road and drove behind us for the last 16km before we called it a day and packed the bicycles on the Jeep and Johan’s car to go through to his farm. 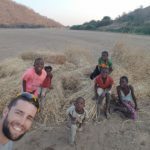 Johan and his family live in an amazing location surrounded by farmland and Baobabs in the area. It has a very colonial feel and they even have a polo field down the road. Johan and his family really spoilt us with a three course dinner which was the best meal of our trip so far especially the delicious strawberry risotto starter. We couldn’t be more grateful to them for being so welcoming and looking after us all. Paola has her own business called Essential, which is a natural skincare brand of products that she started to make as a hobby but has now blossomed into a successful business. Cam is super happy to have some of her products to use for the rest of our trip. Find out more about her amazing skincare range by visiting www.essential-zambia.com. Cam giving out some toys to some local Zambian kids on the side of the road. 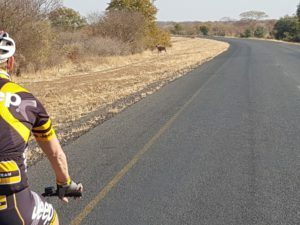 After having some banana bread and apple tart for breakfast compliments of the Beukes family, we got transported back to the main road to start our cycle leg up to Lusaka. The weather had changed overnight and it was cloudy and extremely windy which meant we were in for a very tough day again on our bicycles. The first 20km of the ride included one of the steepest hills we have ridden so far on this adventure and adding a headwind made it even more challenging. The rest of the ride was a constant pull up towards Lusaka. Whilst riding we came across a small group of children on the side of the road so we decided to stop to give out some toys that we had from Mattel to giveaway along our journey. At first the children seemed very apprehensive and almost ran away from us but as soon as Cam started showing them how the bubble wand worked they all started to smile and laugh. They couldn’t speak any English but kept speaking in their local language so we not sure what they were saying but it sounded like they were very happy and grateful. We eventually got to Lusaka to Gareth’s friends place where we are staying for one rest day. Bryan’s parents and his sister also drove down from Chingola to meet us all here in Lusaka. 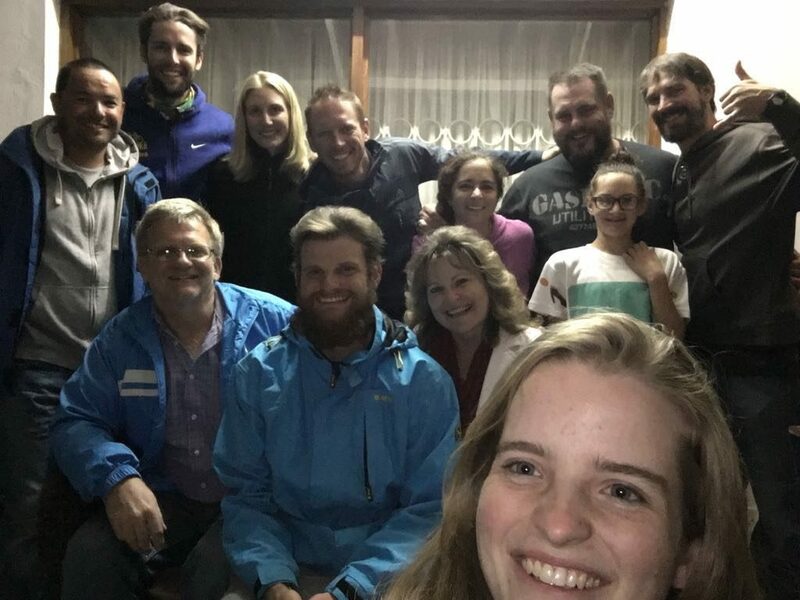 They came through for a braai last night which was really great to finally meet them and to catch up on our incredible journey so far. 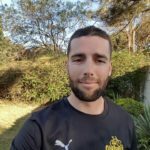 Since our last update we have had an incredibly busy and action-packed few days. 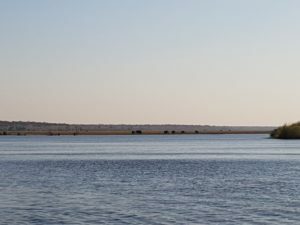 Our last day in Botswana was spent in Kasane (Chobe) where we ended off on a three-hour boat cruise with Thebe River Safaris. 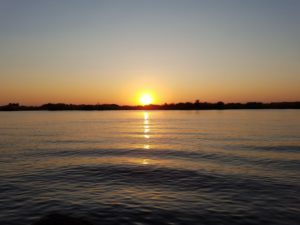 The river cruise takes you into the Chobe National Park on the Zambezi river where we saw elephants, buffalo and lechwe feeding on Sedudu Island, crocodiles and hippos on the banks and some giraffes coming down to drink at the river edge as well as an incredible African sunset. It was definitely the perfect way to end our stay in the beautiful country of Botswana. 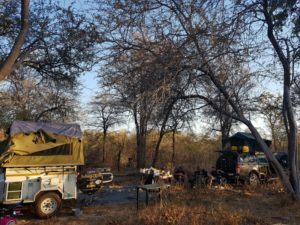 The next day we left Thebe River Safari Campsite fairly early as we knew we had a border crossing to contend with and we weren’t sure of how long it would take us to get through to Zambia. The Kazungula border crossing is quite unique as you have to cross over the Zambezi river on a ferry to get to the Zambian side of the border. The four cyclists crossed over ahead of the cars. As there was a lot of paperwork to deal with to get the cars across we decided to get a local to help with all the admin which in hindsight cost us a lot more than we would have liked but they really helped Bryan and Bobby get through the process quicker which ended up being over 3 hours. A lot of lessons were learnt at this border crossing which we will take with us to all border crossings going forward such as making sure you have US Dollars or Kwacha ideally to pay with at the borders and do your research on all the costs you should be paying before crossing. Due to the delay at the border to get the cars processed we only started cycling at around midday in the heat of day. 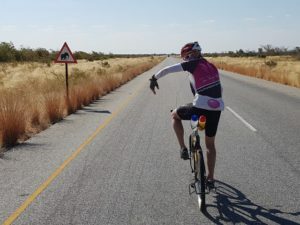 To make the conditions more challenging we also had a headwind to contend with and a couple of hills which we haven’t seen in weeks since riding along the flat roads of Botswana. After probably one of our toughest but shorter rides we finally made it to the wonderful Jollyboys Campsite. As Warrick works in the action sports industry he has good working relationships with a lot of the action-sport companies in Livingstone. 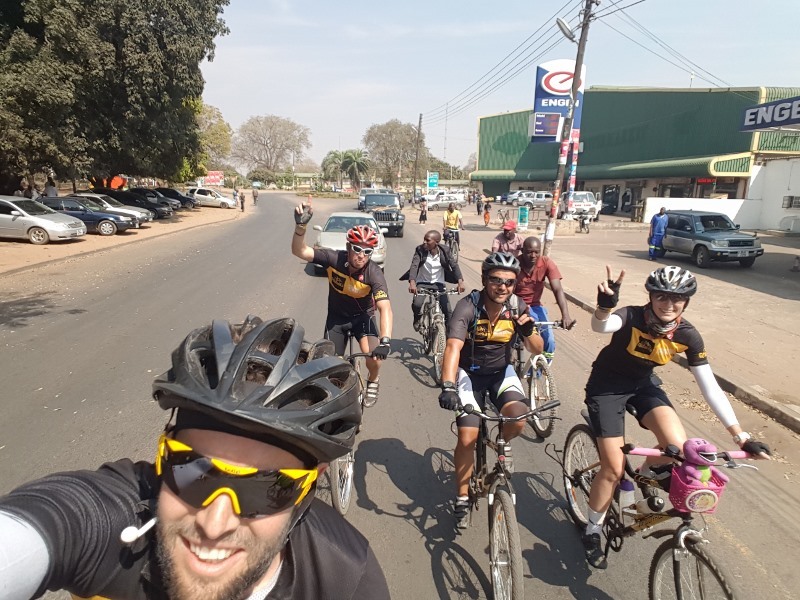 One of Warrick’s colleagues is Tony Barnett who a few months back suggested that he would be able to arrange for the team to bungee jump with a Qhubeka bicycle whilst in Livingstone. 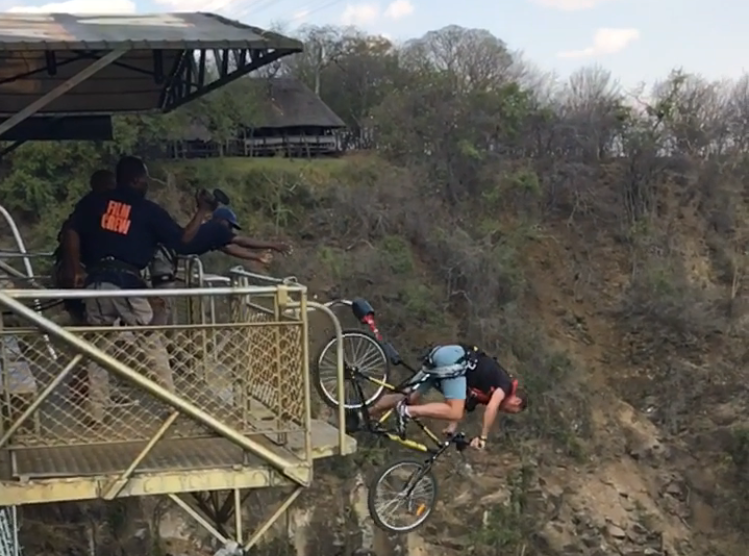 Both Derrick and Gareth decided they wanted to take on the challenge and they made history by being the first ever to jump off the Victoria Falls Bridge with a single-speed, 20+kg bicycle! Thanks to Shearwater Bungee for helping make their bungee cycle successful. Bobby as well as Warrick and the team mascot, Barney, also bungee jumped but with no bicycles. To read more about it and to view the video click here. 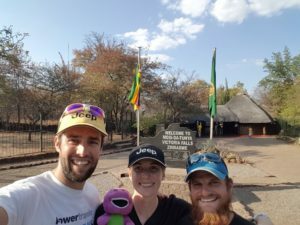 Warrick, Bryan and Camilla decided to walk over to Zimbabwe to go view the natural wonder of the world, the Victoria Falls. The rest of the team stayed behind at the Bungee restaurant to celebrate the successful bungee jumps. 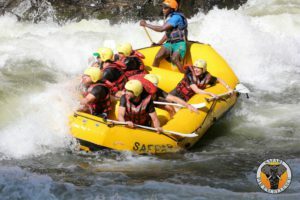 To keep the adrenaline pumping the next day, Tony Barnett helped organise the whole Joburg2Kili team to go for a half day trip White Water Rafting down the Zambezi in the Batoka Gorge with Safari Par Excellence. Although we only did a half day trip, this still included the 10 biggest rapids. The river guide, Boyd was really fantastic and even though he was taking us through the hardest lines on the first 6 rapids we managed to not tip over. It was only at lucky number 7 that things took a flip. Cam, Warrick and Gareth fell out the raft at 7 and then at Rapid 7b the boys went down into the rapid and hit the first wave, which flipped the entire raft over. This was followed by another flip at rapid 8. Rapid 9 is a compulsory portage as it is a class 6 rapid which is extremely dangerous. The final rapid we went down was rapid 10 which we managed with ease. It is incredible to see how powerful the river is even though it is not at its peak. Once off the rafts we then had to hike up a 200m gorge which had incredible views from the top. We were then taken back to David Livingstone Hotel for lunch before being taken back to Jollyboys Campsite. To check out the highlights of our rafting experience click here. In the evening we thought we would treat ourselves to a drink at the famous Livingstone Hotel that looks over the Zambezi. As there are so many great things to do in Livingstone we decided to change up our schedule a bit and take an additional rest day. To take advantage of the extra day everyone planned their own activities for the day. Warrick, Cam and Bobby decided to go through to have a full body massage at a recommended local spa called Namakau which was much needed after all the cycling we have been doing. 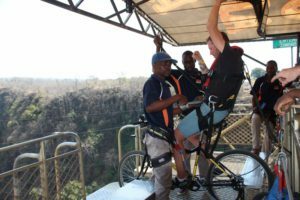 As Gareth and Derrick missed out on seeing the Victoria Falls on the day they did the bungee jump with bicycles so they decided to go through to view this incredible natural wonder of the world along with Bryan. 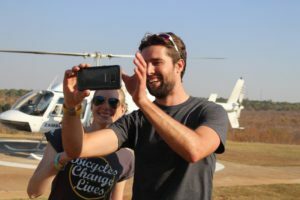 One of Warrick’s contacts, Calvin Mapiye, kindly helped arrange a helicopter tour over the Victoria Falls with the Zambezi Helicopter Company for both him and Camilla so they went through to Zimbabwe to the helipad. 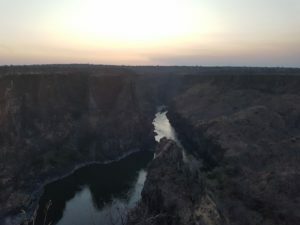 The team then met up again for sun-downers at a viewpoint looking over rapid 7 of the Batoka Gorge. It is an absolutely incredible viewpoint and great way to end our last day in Livingstone. We are now heading north on our bicycles towards Lusaka. The past two days riding have been quite tough with over 30 degree heat, headwinds and a lot more rolling hills. We have been very grateful to be welcomed to stay on two different local farms the past two nights and we are now just past Choma. 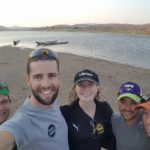 The Joburg2Kili team have made it to Livingstone in Zambia where we are now spending two rest days to allow us to take advantage of all the great activities on offer in the area. 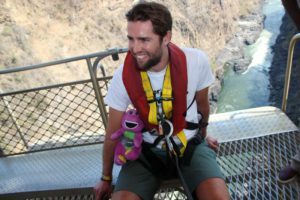 Both Warrick Kernes (cyclist) & the team mascot Barney and Bobby Fuller (support crew member) also bungee jumped but with no bicycles. After two wonderful rest days at Elephant Sands, it was time to get back on the Qhubeka Buffalo Bicycles. We had two days of 75km ahead of us to get to Panda Rest Camp and from there we had a big push of 105km to Kasane. 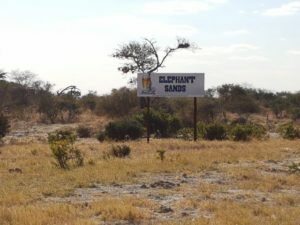 In the first few kilometres of leaving Elephant Sands we were all very excited to see some elephants whilst riding – thankfully they were quite far off the road so we all felt safe enough to stop and admire them. The roads were fairly quiet all day which made the riding so much more enjoyable. After 75km we all decided it was time to find a suitable place to setup our rest camp. After a few attempts to find a suitable spot driving around in the Jeep, Bobby and Gareth finally found a dirt road just off the road that took us to a great bush camping spot. We setup camp and enjoyed some time relaxing once again in the middle of nowhere. The next day we had another 75km ride to our next camping spot called Panda Rest Camp. 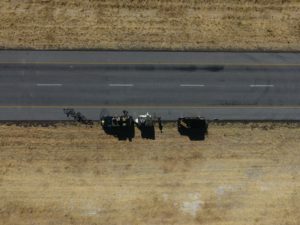 Along the way we were riding along a very straight road that went on for kilometres with bushveld on either side of us so we decided to have a break and Warrick got his DJI Phantom 4 Drone out to take a few videos and photos. It was a very hot and windy ride to Panda rest camp but as it was only a shortish ride we got to camp just after lunchtime. We all freshened up and relaxed for the rest of the day. We also found out that the restaurant at the place did good Pizza’s so we decided to not braai and rather have a team pizza dinner instead. Whilst at Panda rest camp there was a Chobe School camp taking place. The school kids and teachers were very excited about what we were doing and so when we left the next morning they created a tunnel and sang as we left which was a very special send off for all of us. A few 100 meters after leaving Panda Rest Camp, Warrick noticed that Gareth’s back wheel wasn’t true. 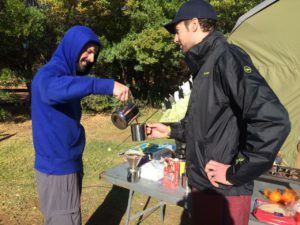 So it was a bit of an anti-climax after an awesome send off as Derrick and Gareth had to cycle back to camp to put on a new back tyre which was all in the Jeep as Bobby and Bryan were still breaking down camp. They managed to put on a new back tyre and we were back on the road again and rewarded with a sighting of three Elands crossing the road in front of us. We actually had a very successful day in terms of sightings seen on our ride which also included lots of elephants, some Zebras crossing the road as well as a pair of Ground Hornbills next to the road. About 20km into our ride from Panda to Kasane, Gareth’s back tyre that he had fixed earlier went flat. It turned out that the new tyre rim did not have rim tape which caused the tube to puncture. To fix the problem we used some insulation tape as we did not have any rim tape which seems to have sorted out the problem. With the two mechanical stops we ended up riding most of the day in the midday heat which clocked in at just over 37 degrees at one point so everyone was taking strain on the ride and we were having to fill up our water bottles frequently but the day was made when we all saw the Zambezi river as we entered into Kasane. 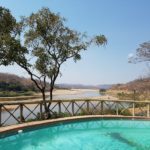 Bryan managed to arrange for us to camp at Thebe River Safaris where we are staying for one rest day before heading into Zambia. As there is no view deck at Thebe we decided to head over to Chobe Safari Lodge for sun-downer drinks which was just magical. 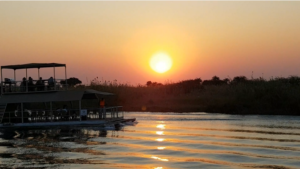 We are planning to take a boat cruise this evening on the Zambezi river which we are all really looking forward to. 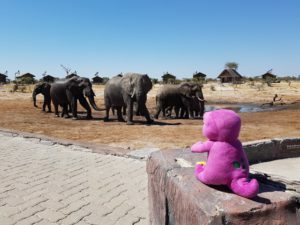 It has been an awesome two weeks in Botswana with many memories we will keep forever and tomorrow we will be heading into our second African country of this trip, Zambia. 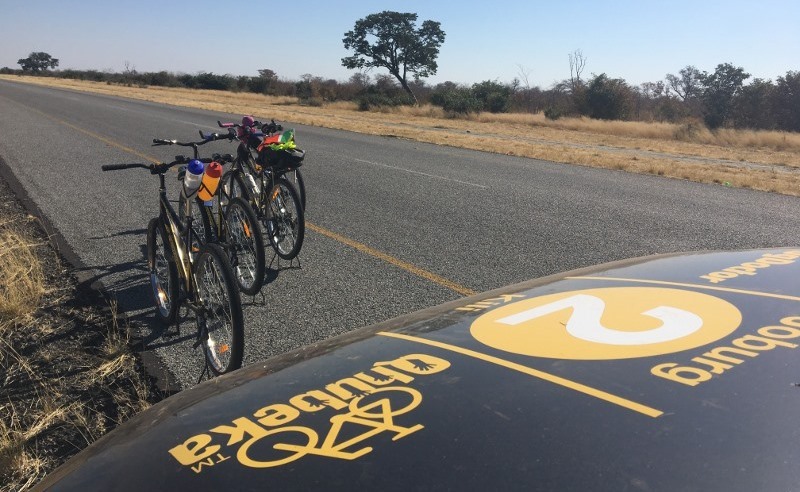 After a much-needed rest day staying at Kwa Nokeng Campsite, it was time to hit the roads of Botswana on our Buffalo Qhubeka bikes. 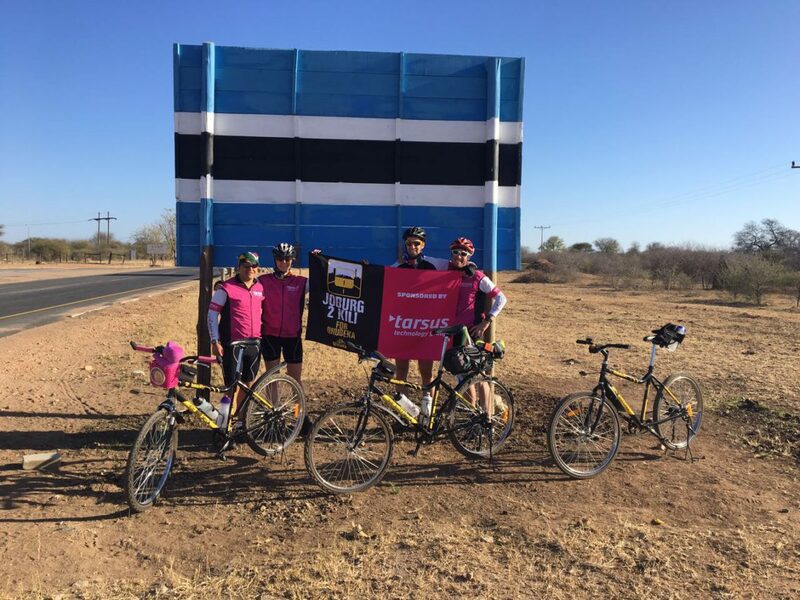 It was one of the coldest mornings (around 3degrees) we have had so far and we all felt a little under-dressed in our Joburg2Kili Tarsus cycle kits as we headed out for a 114km ride to Itumela Campsite in Palapye but it shortly warmed up very quickly. Derrick has been struggling the past few days with a sore knee. 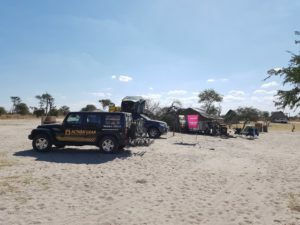 We were all hoping the rest day would help sort it out but unfortunately as we started to ride he decided he was going to rather get into the Jeep and go through to Palapye with Bobby to try see a doctor about it. 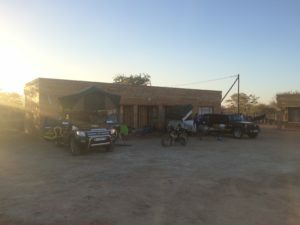 It has been really great having two support vehicles as it has allowed us to send one ahead to go setup camp and/or do some shopping for food. The other vehicle would then sit behind us to warn traffic that there are cyclists ahead and to also allow us to stop and stretch the legs, refill our water bottles, reapply STUF sunblock and grab a few extra snacks. 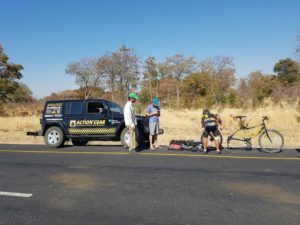 Warrick, Cam and Gareth worked as a team taking turns at riding at the front as we enjoyed riding on the relatively flat and smooth Botswanan roads. Although our average pace was much higher than the past few days, sitting around 23km/h, we were all finding that we were really uncomfortable on our saddles but we just had to keep peddling on. 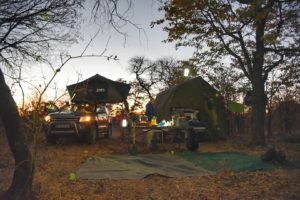 We finally made it to Itumela Campsite where we found Bobby and Derrick who had already setup our campsite. Derrick managed to see a local doctor in Palaype who was extremely helpful and was able to give him an injection for the pain, strap his knee and give him some medication to hopefully help get him back on the bike again soon. Bryan helped sort out new sim cards for us all so we can all be connected whilst we are here in Botswana and can keep our supporters updated on our progress. Luckily it was a really easy process and we are all up and running on our devices. 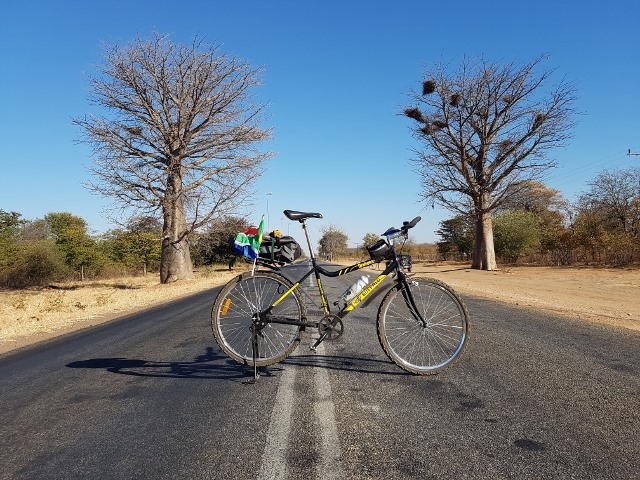 Yesterday we had a relatively easy 82km ride from Palapye to Serule. Derrick’s knee was feeling much better so it was great to have him back on the bike again. We were riding on the A1 main road to Serule and were really pleased to see that there was a side road where we could ride and avoid the traffic. This also meant that Bobby and Bryan could go ahead and didn’t have to follow us the whole time. Other than that we had a bit of headwind but it was not too difficult a day on the bike. Bryan went ahead to find Jaera Guest House which was a place we were told about by some local Botswanans at Itumela Campsite. He managed to find the place but it was really basic so we ended up all sleeping in our tents within their parking lot but it was much safer than staying in a bush camp on the side of the road. 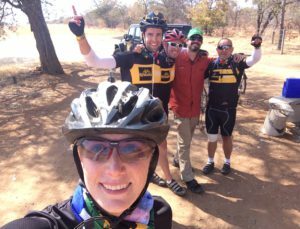 Today we had just over 100km ride to Woodlands Campsite just outside Francistown. We had a very eventful ride as Warrick got the first puncture of the trip. Shortly after patching up his tyre, Cam then got a flat tyre too. Unfortunately, the repair patches were not holding properly and so both tyres ended up getting flat again. 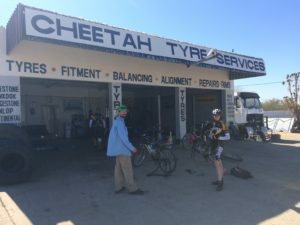 We eventually managed to find Cheetah Tyre Services who very kindly helped us out with better tyre patches. A big shout out to Gareth for all his help changing the Kernes’ tyres over 4 times today. The ride ended on a bit of a low note though as we had just over 10km of rutted, dirt road to get to the campsite and all the cyclists were taking strain. But thankfully the Woodlands Campsite is very decent and after having a shower and taking some time to just sit and relax everyone’s spirits are up again.